In List Of Changes For Secret Service, A New Fence Comes First : The Two-Way An independent review panel calls for changes ranging from a better fence at the White House to a new approach to training and leadership within the Secret Service. 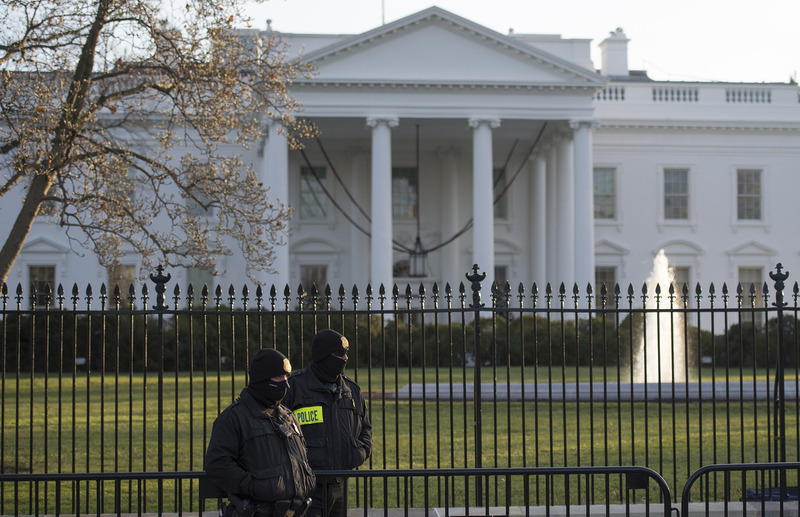 A review panel says changes are needed at the Secret Service — along with a better fence at the White House. Here, members of the Secret Service Uniformed Division stand in front of the White House. The Secret Service must both change the way it trains agents and hire more of them, according to a panel that reviewed the agency that has endured a string of embarrassing lapses in recent months. The panel says its suggestions are "a road map for reform" under a new director. Some of those suggestions are inherently practical — such as one that states "the fence around the White House needs to be changed as soon as possible to provide better protection." The panel stated, "the ease with which 'pranksters' and the mentally ill can climb the current fence puts Secret Service personnel in a precarious position," in which agents must quickly decide whether a threat might require a potentially lethal response. The call for a new fence comes three months after a man scaled the White House's 7 1/2-foot fence and ran toward — and inside — the building. Other suggestions require changes within the agency itself. The panel devoted a portion of its executive summary, which was released today, to leadership. It recommended changes in everything from increasing accountability to being more open to input from officers and agents. Saying that the Secret Service's "training regimen has diminished far below acceptable levels," the panel recommended a "Fourth Shift," shorthand for a process in which personnel on its presidential protection detail would devote two weeks out of every eight to training. And it recommended a boost in staffing to make that training possible. The panel also said that the next director of the Secret Service should start with a blank slate when formulating a new budget. The agency has been without a permanent chief since its former leader, Julia Pierson, resigned after weeks in which the agency lapses made headlines. Saying that the group's suggestions "are astute, thorough and fair," Homeland Security Secretary Jeh Johnson said that some of their ideas "are similar to others made in past agency reviews, many of which were never implemented. This time must be different." Johnson commissioned the four-member panel to conduct an independent review of the agency in October. Noting that the Secret Service normally maintains a low profile, the panel wrote, "Most Americans know little of the work of the Secret Service's Uniformed Division and do not realize that it is the Uniformed Division that plays a primary role in the protection of the White House." It added that in talking with people both within and outside the federal government, it was broadly believed that the Secret Service "is without peer" in its work protecting a chief executive. "For an organization that has a zero-failure mission, however, a commitment to constant improvement and a refusal to compromise are essential," the group added. The executive summary is likely to be the only form in which the general public learns of the suggestions. Because of security concerns, the full report will not be made public. For its review, the executive panel spoke to around 50 current and former members of the Secret Service, as well as more than 120 experts who work either in research, for other federal agencies, or in major security and police forces. The review panel included former Associate Attorney General Tom Perrelli, former Deputy Attorney General and former U.S. District Court Judge Mark Filip, former Cabinet Affairs Secretary and Assistant to the President Danielle Gray, and former White House Deputy Chief of Staff for Operations Joseph Hagin. "We believe that the Secret Service must commit itself to the kind of transformative, continuing change discussed in this report," they wrote.